P&B Textiles Ramblings 11 RA11-778W. This fabric is a white on white pattern. This white-on-white background has an elaborate and distinctive pattern. 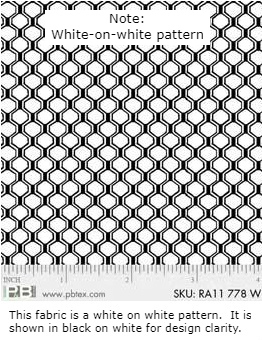 This fabric is shown in black on white for design clarity only. Use these as backgrounds for appliqué and modern quilt piecing, to add that extra spark of interest. 44" inch. 100% cotton.